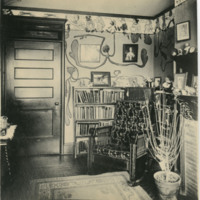 Interior view of the room of Abbey Slade Brayton (1894) and Emma Doll Bailey (1894) in Denbigh Hall (soon after its completion). 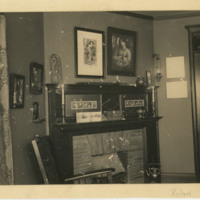 The image depicts a furnished and decorated sitting room. 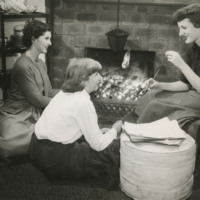 Photograph of three students roasting marshmallows over a fireplace. One is seated in a chair or recliner while the others are seated on the floor. 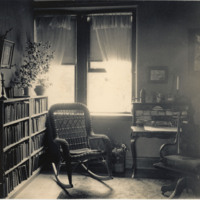 An ottoman and some dishware on a rack is also visible in the background. 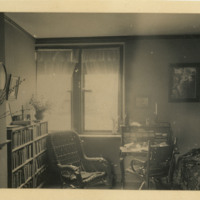 Unidentified furnished dorm room at Bryn Mawr College. 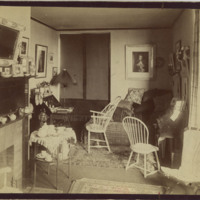 Single dorm room in Pembroke East, prepared for the Louisiana Purchase Exposition, St. Louis, 1904. Printed on front: "Undergraduate single room / Total cost of tuition, board and residence for / the academic year $525.00". Inscribed on front right corner of photo: "Broadbent". 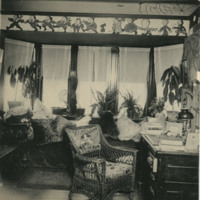 Unidentified dorm room, prepared for the Louisiana Purchase Exposition, St. Louis, 1904. 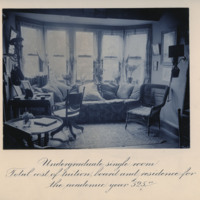 Printed on front: "Undergraduate single suite, (study and bedroom) / Total cost of tuition, board and residence for the / academic year $675.00". Inscribed on front right corner of photo: "Broadbent". 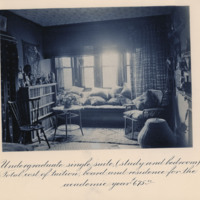 Two identical images of the interior view of a student's room in Merion Hall. 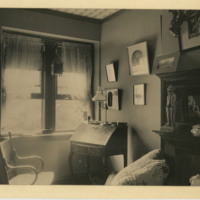 The image depicts a furnished and decorated corner of her room.